A closeout item. Available quantities and sizes are limited. Choose a neoprene girth if you want to decrease movement of the girth on the horse. Neoprene, when dry OR wet has excellent properties to help avoid friction sores. 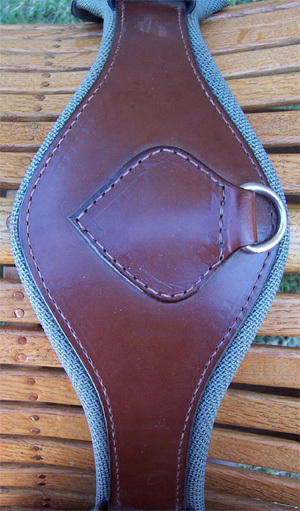 This girth is contoured in the elbow area , allowing the girth to be positioned somewhat forward without rubbing the elbows. In addition, a layer of neoprene and leather continues up past the rings, to allow a thick,comfortable interface between the horse and rings. The cinch rings are standard Western type with tongues. One dee is located in the sternal area, for attachment to breastplate or rear cinch. Easy to wash and exceptionally durable. Ortho-Flex neoprene comes in different styles - Silver/Waffle or Black Woven. Not all sizes are available in all styles. Please call for availability.